This second book featuring Inspector Bordelli is set in Florence in 1964 and starts with Casimiro turnings up at police headquarters and insisting on telling his old friend Inspector Bordelli about something he'd just seen near Fiesole. In typical fashion, instead of allowing Casimiro to come straight out and tell Bordelli what he's just seen, he first offers him a cigarette, then sends him to fetch a couple of beers, and next (rather randomly) tells him about his recent birthday on the second of the month (April), inviting him to guess his age (54). Eventually, the anxious Casimiro is allowed to report what he's seen, a dead body that he almost tripped up over. And finally, Bordelli gets up and goes with Casimiro to find the corpse. But when they arrive, the body has mysteriously disappeared. Bizarrely, as they are looking around, a doberman rushes towards them and is about to attack before Bordelli shoots him dead. They then walk back to the car, but on a whim, Bordelli then turns back to where he shot and left the doberman, only to find that it too has now gone missing. This opening set of scenes really gives the flavour of the whole book, wherein Bordelli is set two challenges. One is to find who is killing small girls, and biting their stomachs (the killer's signature) and the other is to find who is responsible for the subsequent murder of his friend Casimiro. This is a complex novel, full of rich asides and comic interludes, such as the descriptions of Bordelli's interactions with the cook (Totò) in his favourite restaurant Da Cesare. There are descriptions of the inevitable links back to the past, and what happened during the war, and a present day search for Nazi war criminals hiding out in Italy is also worked into the story. 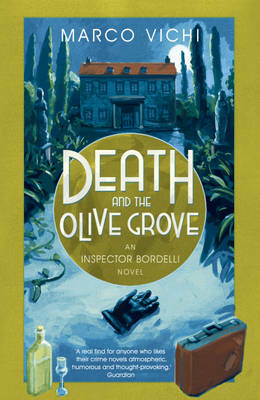 Bordelli is driven almost mad with his search for both killers, and only survives through his friendships with others, his indulgence in good food at his favourite restaurant, a romantic dalliance (or two, if you also count Bordelli's side-kick Piras) and the soothing company of the all important Rosa, a retired and wealthy prostitute, who cooks and knits for him and sits talking with him until late into the night. The references to food even lead to a description of a recipe 'Botta's Pork Chops' (referred to in the novel) in the acknowledgements, which I will have to try. Beautifully translated by Stephen Sartarelli, I strongly recommend that you read the novel as it is a real delight and pleasure.